My impression is that most of us think that, as a general rule, all fruit trees need to be pruned. It’s simply not true, especially regarding citrus. In contrast to this mistaken notion I’d say that, as a general rule, citrus should not be pruned. I can think of only a couple of exceptions to this rule. In my yard I grow eight varieties of citrus, and out of those eight I only ever touch two with my pruners, each for a different reason. I give our Bearss lime tree haircuts because I want it to stay small, to about the height of my three year-old son. It already produces more limes than we use at that diminutive size. Once a year I prune it by just trimming off every branch that is taller than I want, or by handing Cass the pruners. Five year-old lime tree being pruned by a three year-old boy. I also prune our large Valencia orange tree. It’s 25 feet tall, and I’ve never tried to trim the top. Rather, I prune the sides and interior to create an umbrella shape. I keep its skirt a few feet off the ground and then I keep the inside pruned high enough that we can walk around under it so that it feels like an outdoor living room. I prune up a couple of spots on its canopy edge to make doorways for entrance. Shaping this citrus tree in this way makes it a very comfortable spot to sit in the shade on a summer day. I’ve even hung a swing from one of its branches. Keeping a tree small like my lime and shaping a tree like my Valencia are the only two good reasons I can think of for pruning citrus. There are plenty of bad reasons though. The worst reason, or way, to prune a citrus tree that I’ve encountered is opening up the tree’s canopy so the interior gets sunlight. That can be a good idea for some other types of fruit trees, like plums and peaches. It’s definitely not advisable for citrus, however. Why not? 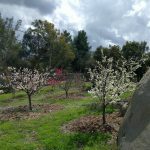 I once did a home consultation at a multi-million dollar residence in Rancho Santa Fe where the owners had put in an orchard of a few dozen fruit trees and then their hired gardener had pruned all of the citrus trees just like the peaches and plums. The foliage had been thinned, entire branches had been cut out, the canopies had a skeletal look, and the effect was that you could see lots of light going through the trees and hitting the interior branches. Why are our citrus trees dying? the owner asked me. All of those interior branches now exposed to the sun were cracking and blackened from sunburn. Yes indeed, trees get sunburned. If you want to keep a citrus tree small or shape it, then trim the outside like you would trim a hedge. Don’t cut out entire branches and expose interior parts of the tree that are used to being shaded. Have a look at this video showing how citrus farmers mechanically prune their trees. This farm is in Spain, but the same technique is used here in Southern California, and the world over. A citrus expert once told me that if a citrus tree is in prime health, then if you look at its canopy you won’t be able to see any light or sky through it. It should be a dense green globe. A couple of other no-good reasons to prune citrus include cutting out dead or crossing branches. That’s just a big old waste of your time. Do it if you have nothing better to do, but your citrus tree couldn’t care less if some of its branches are crossing or are dead and hanging. Both are harmless and natural. I don’t cut out any dead or crossing branches on my citrus trees and they’ve never complained about it. Also, if aphids or leafminers or other insects have damaged the leaves of your citrus tree, don’t waste your time cutting those damaged leaves out. They’re still capable of photosynthesizing and contributing to the growth and fruitfulness of the tree even though they’re not completely healthy. Pruning them out won’t make a significant difference to the insect population in the tree either. Better to adjust your aesthetic sensibility than cut up the tree, in terms of the health of the tree. Lastly, and here’s a bit of a twist, do pay attention to what’s growing from low down on the trunk of your citrus tree. I don’t think of this as pruning, but it’s really important that if any branch starts growing from below the graft (bud) union of your citrus tree you immediately remove it. 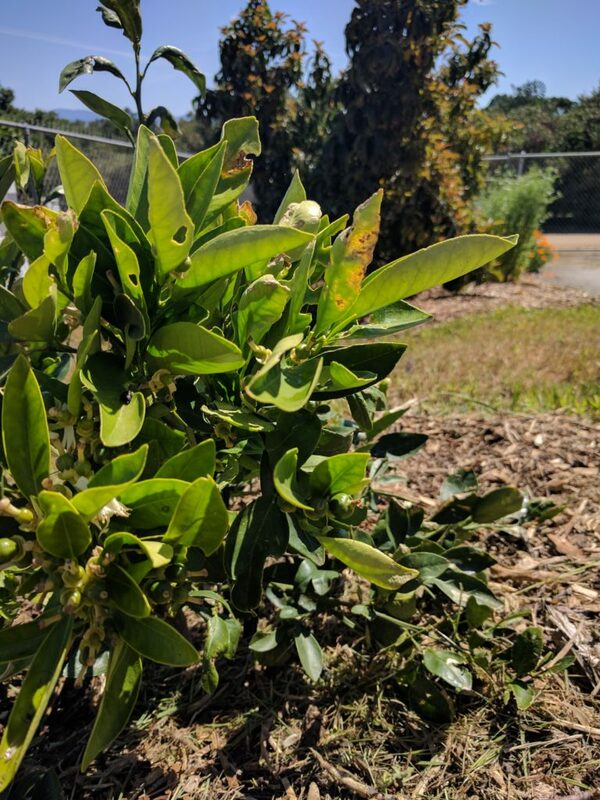 If you’re unsure of what I mean by that, then please read my post titled, “Beware of rootstock suckers on citrus.” It might save the life of your tree. Whenever you have pruners in hand is a fine time to prune citrus, with a couple of exceptions. One, if there is immature fruit on the tree, you might want to wait until after harvest. For example, if you’re dealing with a Satsuma mandarin tree whose fruit ripens in the winter, then you might want to wait until the spring so you don’t sacrifice fruit. Two, if you live in a place that gets cold enough in winter to sometimes damage citrus, then you might not want to prune in winter or even fall. 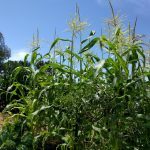 The reason for this is that you’ll want to enter winter with a large canopy so that you have extra leaves and branches to take any freeze damage that might occur. (The inside canopy will be protected by that outer foliage, unless the freeze is severe.) 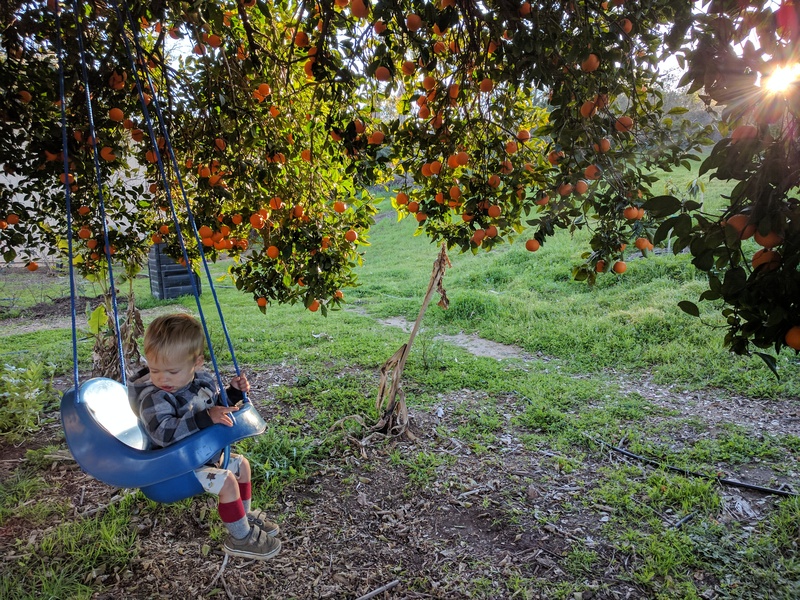 It doesn’t get cold enough to damage citrus in most of Southern California, but it does in many parts of the rest of the state, as well as most of the rest of the U.S.
Isn’t it a relief, though, to know that your citrus tree knows how to grow pretty well on its own? That’s why you can find citrus trees thriving even in Southern California yards that have been neglected for years. And that’s why every Southern California yard should have a citrus tree, or eight. Greg, i don’t know if you noticed, but my lemon tree lost most of it’s leaves during the winter. It’s loaded with fruit, and is growing new leaves now. But is this normal? what should I look for? Cool Greg, I can’t wait to plant an naval orange tree!! We grow a lot of citrus in Arizona and they require a lot of water here due to the heat in the summer. Sunburn is a real problem here and many don’t know to leave the canopy alone to protect the tree. Thanks for that, Alan. If we have to be careful about sunburn here, you must need to be even more careful, I’d imagine. We planted a small grapefruit tree about 4 yrs ago. It finally took off last spring and grew in trunk size as well as height. We live in South Texas and after hurricane Harvey then extreme cold temps this winter the tree has nothing but dry dead looking limbs, lost all leaves and little green balls that turned brown then fell off. My husband wants to cut it down said it’s gone. I don’t, I want to wait till warmer weather and just see. Any way to tell if it’s truly gone? What a rough go! Sorry to hear about all of that. There is indeed a simple way to tell if there’s still life in the tree. I did this just the other day on a sycamore in my yard that I suspected of being dead. It turned out to still be alive from halfway down the trunk. Scratch the bark on any limb with your fingernail. If you find green underneath, there’s life. It’s as simple as that. Start at the top of the tree and work your way down. You might find, as I did with my sycamore, that the top or outside limbs are dead while the lower part or inside limbs are still alive. Scratch here and there to discover. The tiny wounds you cause while doing this are no big deal. If you find green (live cambium), then the tree should do some leafing out soon as it warms up. As for citrus specifically, I’ve seen some dead-looking trees sprout up again from down low on the trunk so it’s definitely worth not giving up on. 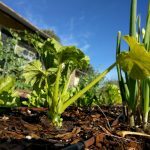 Do be aware of those low sprouts possibly being rootstock suckers though. I spent a winter in the UK myself, and I think I felt like your citrus tree: a fish out of water. I didn’t even own a jacket when I arrived. I know it’s hard to resist the temptation, but your tree is best left alone rather than being cut back. Let it show you where it still has life as spring progresses. Only then, after it’s clear which parts are dead, should you cut those dead limbs off if you wish. The main reason for waiting is that trees sometimes surprise you with where they are still alive. Also, at least in a warmer climate like here in Southern California, dead upper branches can provide beneficial shade for lower branches as the lower branches come back to life. Those lower branches have likely been in a lot of shade in previous years and will sunburn if they are exposed to full sun. Once new leaves are shading their bark, then it’s safe to cut off the upper dead limbs. and I’ve been trying for three years to get a wurtz or little cado. Why haven’t you found one? Wertz (or Little Cado) are available at many nurseries, even Home Depots in Southern California. Holidays are commonly available too, and they are the dwarfiest avocados I know of. Can I try to help you locate a good avocado for your situation? 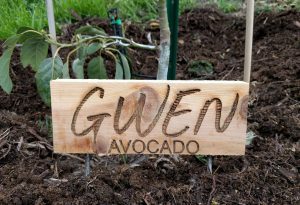 Everybody in Southern California needs an avocado tree! Do you fertilize your citrus trees? Every resource I look at says to fertilize it, but I think I remember reading that you never fertilize your trees but instead you mulch them. Is that the case with your citrus trees as well? They look great! My citrus trees fruit well, and they look pretty good although the citrus trees of some of my friends who fertilize look deeper green certain times of the year and tend to grow faster. I’m fine with that. I want fruit not leaves. And my trees give me plenty of fruit. I have a couple guesses on why almost every resource says to fertilize your citrus trees. One is tradition, habit. They’ve never tried NOT fertilizing, especially in conjunction with mulching. Two is that they sell fertilizer. 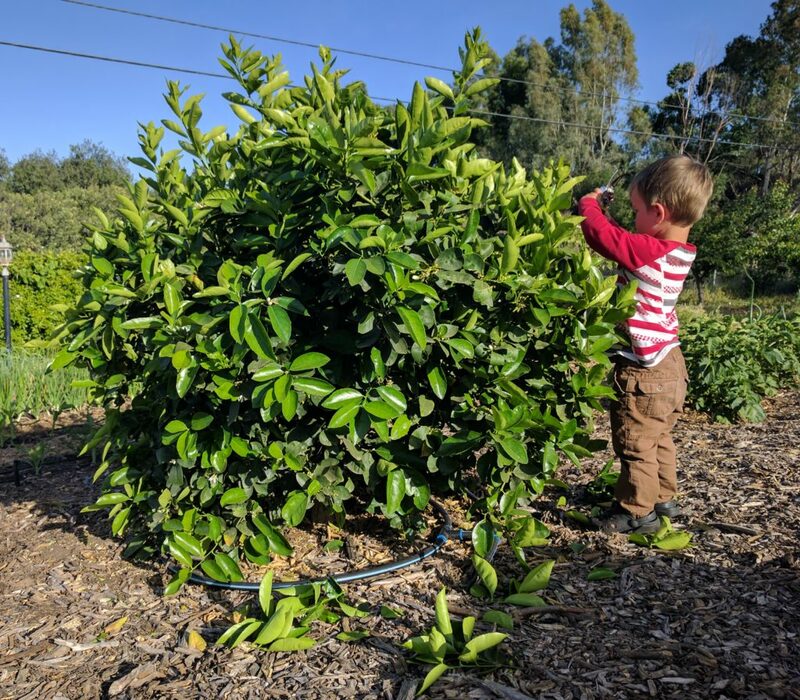 Ask at most nurseries how to make sure your citrus tree is healthy and fruits more, and they’ll almost certainly recommend some kind of fertilizer product. They’re not evil, it’s just how they make money, and most customers like the idea of being able to buy a simple solution in a container. It’s like when you go to a doctor and get a prescription. That makes many people feel better than being told to rest and drink plenty of water. Alright thanks, I am gonna skip fertilizing and keep the mulch program going. By the way, do citrus trees bloom at different times of the year, or just spring? I have an established Valencia orange tree that took extensive damage last fall. I pruned the broken branches and fertilized it in early spring this year and it put on a ton of new vegetative growth, and I was wondering if it would flower later in the summer. Most citrus bloom only in spring, but a few have smaller blooms at other times, such as the Bearss lime. Also, if a citrus tree has been stressed and then recovers, it sometimes blooms. For example, if it hasn’t been watered enough but then gets watered it may bloom. Usually in that case, the flowers won’t set fruit though. So it’s possible that your Valencia will do a strange late bloom, but I’d be surprised if it set fruit. Let us know what happens. Fingers crossed, I will let you know if it blooms. I am just glad it recovered. Thank you so much fo your amazing, informative blogs! I learned that I should not have let my new orange tree fruit during it’s first year last year. This year, we have no flowers at all. Is there anything I can do? I don’t think it’s a rule to not let a first-year citrus tree fruit. Sometimes I do and the tree does fine. But it’s true that a new tree will usually grow more canopy if it’s not trying to grow those first few fruits. That way it’s more likely to provide a bigger crop in its second or third year. Your orange tree might still flower. Some of my citrus trees are just starting to show flower buds here in late April even though others are already finished flowering. Don’t give up hope on that yet. If you end up without flowers this spring, there’s nothing you can do except look forward to a likely heavy flowering next spring. Usually, if an orange tree has a light (or empty) year, it will be followed by a heavy crop year. I don’t know the differences in flowering habits of citrus in Florida compared to California, but a sure way to not prune off flowers is to prune while the tree is flowering. 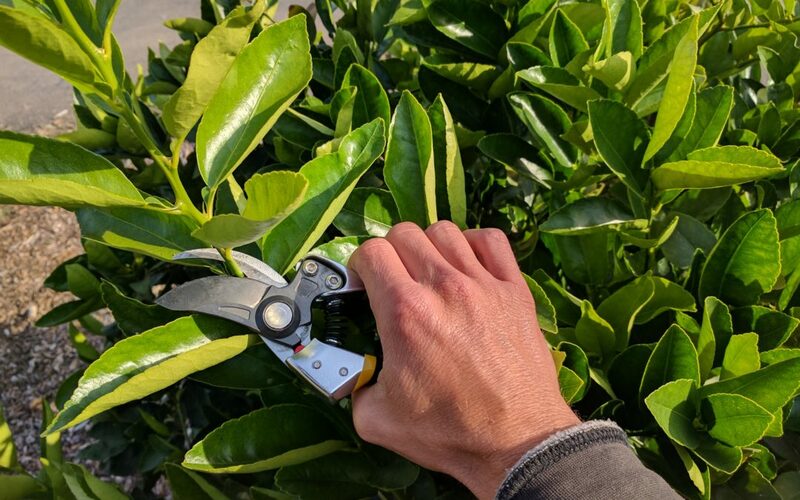 For example, I often do some pruning of my citrus trees in March or April here in Southern California because at that time I can see where the flowers are and how much potential fruit I’m cutting off. How long after a light pruning for shape control done in late fall will the citrus likely begin to bloom and resume producing fruit? Thanks in advance for your consideration. A light pruning in the fall should not prevent the tree from flowering here in the spring although any pruning any time will reduce the amount of bloom and fruit production somewhat. If your citrus tree hasn’t bloomed this spring, it’s possible there are other factors involved beyond your pruning. For example, citrus trees can have very light bloom and fruit production after a year of heavy bloom and fruit production. My Valencia orange tree did this last year. Hi Greg, so great to get some sensible advice on citrus. I’ll stop doing the open interior pruning. I live in Northern CA near San Mateo. I’d like to plant a tree along the same row as some of my citrus, against a fence. I’ve considered ornamentals and fruit, but I need something that will grow up and provide screening FAST, so I think that citrus (such as a navel orange) might be too slow. But then I thought about avocado. We love to eat them of course, and Fuerte is a favorite. I understand that it is also self fertile. I’m looking for: excellent fruit; fast growth, ideally in the shape of your Valencia, rather than stick-like (I’ve heard that either Bacon or Reed is very erect), to provide good screening from our neighbor’s house; attractive and evergreen appearance; and suitable for my climate. Any thoughts on Good avocado or citrus (or other) choices to meet my needs? 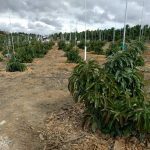 Some citrus trees on standard rootstocks can grow pretty fast, but not quite as fast as some avocados. Both are definitely useful as edible, evergreen screens: my driveway is lined with citrus and avocados, and they look pleasing all year. There is also something to eat on one of those trees all year. Some avocados tend to grow more vertically, like Bacon and Reed, whereas some grow more horizontally, like Fuerte. However, you can direct the growth of most varieties with a bit of pruning. My Reed, for example, has a spreading canopy because of the way I’ve encouraged it to grow through a few pruning cuts. Citrus almost all naturally grow in the globular shape that you seem to desire. So there would be no pruning work there. Hello, I want my lime tree to stay at a certain height, can I prune the top off. It’s a large branch. It’s getting too tall, over eight ft. If yes when is the best time. Yes, you can prune off that branch on your lime tree. Doing it any time outside of summer is best for a large branch just to avoid sunburn. Likely, you’ll be exposing some lower branches to sun when you cut out a large upper branch. Paint any exposed branches with white latex paint mixed 50/50 with water to sunscreen their bark. Alternatively, if you prune in late February, it’s likely that new growth will soon fill in fast and you won’t need to do any painting. I have a Valencia orange tree just like yours. I am located in Santa Monica, California. My tree is at least 30 years old, seedless, super juicy, and SUPER TALL like yours…. 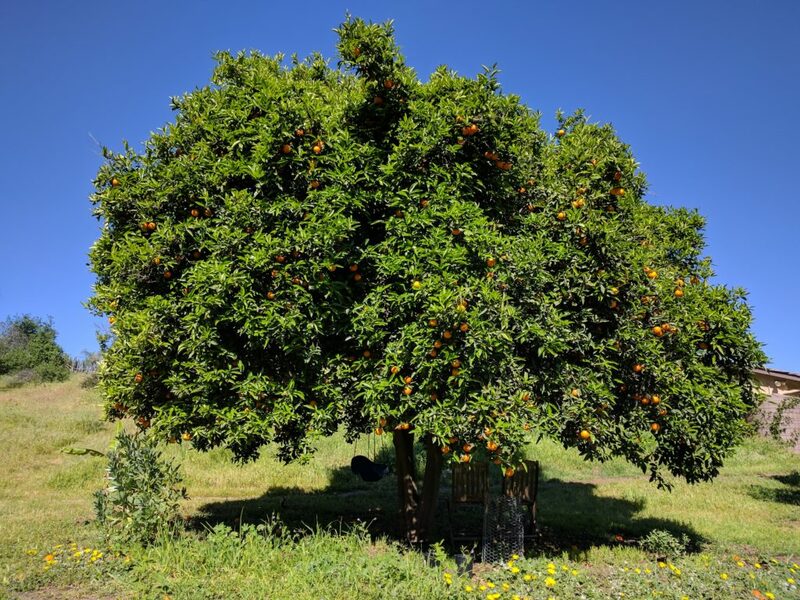 I love the tree but I will not be able/should not risk to climbing up the tree to harvest the oranges because I am getting older…………The tree is wedged between my carport and my neighbor’s fence. I considered to get rid of the tree but it would be such a waste. The tree grew up and I never thought of trimming it to maintain the size. My preference would be to grow old with the tree. Would the tree grow back if I cut half of the tree to 5 feet tall, meaning to bare large branches? And then proceed downsizing the rest of the branches a year later? Or do you have any suggestions? Thank you for your wonderful blog! I look forward to it every Friday. Sorry this reply and this week’s post didn’t get to you until Saturday. Thanks for writing. I have a couple of ideas for your Valencia tree situation. Instead of climbing the tree or using a ladder, you can pick the fruit with a pole picker. That’s how I pick my Valencias. I never climb the tree or a ladder. I’ve made my own pole picker that can extend about 30 feet. I bought a fruit picker basket and attached it to an extendable painter’s pole. It’s not so easy to pick the fruit that is 25 feet up there because the pole gets heavy and unwieldy when it’s fully extended, but it gets the job done. I have limited experience drastically reducing the size of large citrus trees, but when I have done it, I’ve done it over the period of a few years — a couple feet cut off each year — and I’ve painted white the newly exposed branches because they will sunburn. It is possible. But be aware that the tree will explode with growth each year and try to get back to its 30-foot height. If at all possible, I’d leave the top unpruned and find the easiest possible way to pick the fruit safely. We have a young pomelo tree (planted last spring) and it really shot up this summer. The main center branch has gotten really tall. Is it advisable to top it at this time so we can begin shaping the tree? Also, side branches should be cut back as well? Side branches have also gotten long and not very sturdy. We live in Southern California , inland empire. I’ve just been thinking similarly about a couple of my young citrus trees. Here in the fall, the consideration about whether to prune citrus mostly depends on the likelihood of damaging cold weather this winter. If it often gets cold enough to damage citrus trees where you live, then I’d wait until spring to prune. The Inland Empire is mostly warm enough not to worry about that, but you know your yard and its microclimate. If you pruned now, then a freeze hit this winter, the tree would incur more damage. It is the outer branches (the ones you hypothetically pruned off) that protect inner branches and take the brunt of the cold first. Safest bet? Wait until March to prune. Then go ahead and cut back that center top branch as well as the side branches. My Satsuma trees only produce fruit from the bottom half of the trees down. They are healthy fruit and sweet and juicy however. It’s just that there is NO fruit on the top half of the tree. The trees are 6 years old, 10 feet tall but only set fruit for the first 5 feet. I’m in South Louisiana. That’s curious. Do you prune the tops ever? Does it also not flower in the top half or just not set fruit? My lemon tree growing out long stems look like long vines. Should I trim them back. Very long. Thanks. Lemons are famous for their “wild hairs.” You don’t have to trim them back, but you certainly can any time you want. Hello. My mother’s neighbor has a mandarin tree with the most delicious mandarins with thin peels – like cuties, but much sweeter and more delicious. I have taken branches along with the fruit to Armstrong Nurseries to try to find out what type it is so I can plant as well and no one has been able to identify. What suggestions do you have in the effort to identify and plant it myself. Tough situation. To identify the mandarin, you can refer to the variety descriptions and photos on the website for the Citrus Variety Collection of the University of California, Riverside. Here’s the link to the page for different types of mandarins. Some elements that will help you narrow the options include when it tastes sweet (harvest season), whether it ever has seeds and how many, fruit shape and size, peel thickness and ease of peeling. Also consider how old the tree might be. If it’s less than ten years old, then it could be one of the more recently released varieties in California like Kishu or USDA 88-2. But if it’s an old and large tree, then it’s more likely an older variety like Dancy or a clementine. Does your mother’s neighbor know where the tree was purchased? If so, go there to ask where they buy their citrus trees from (or where they did when this tree was bought). If you can figure out who the wholesale grower was, you could contact them and they’d probably be able to help identify it. Another option is to take some photos and post them on the citrus forum at Tropical Fruit Forum. Citrus aficionados there might be able to help identify it. Finally, since you want to grow this variety yourself you could make your own tree. The surest way to get the exact tree you want would be to take a bud from your mother’s neighbor’s tree and graft it onto a tree in your yard. Citrus budding is not very difficult as far as grafting goes. I’ve even done it! Here is a document to guide you in that process: Budding and Grafting Citrus and Avocados. Also have a look at videos on YouTube by Fruit Mentor. Here’s my citrus situation. I’ve had a lime I ignored for 4 years that produced 1 lime last summer. Nothing since. Six months ago, received a new Meyer lemon that has lots of lemons but only 1 mature enough to pick. Nothing since. Yesterday, planted a new 15 gallon Valencia with lots of fruit. Several experts say to cut off the new fruit so the trunks can grow well, to fertilize, water differently and mulch. We just put mulch down and changed the watering to circle the roots (it was a drip at the trunks). I’m at a loss as to what to do for the 4yo lime, the 6mo old lemon and the brand new orange tree. Is it the soil, the slope, me? I’m new to this, as I’ve mentioned in other posts. 🙂 Thanks! Bummer. You should definitely be getting more from that four-year-old lime tree. Maybe thin fruit from that Valencia, maybe not. Send me photos so I can see the trees. It is helpful for the trees to receive their water away from the trunk once they’ve been in the ground for at least six months or so. Trees prefer to grow their small roots, from which they drink, away from the trunk. I will email you the pics. Thanks so much!